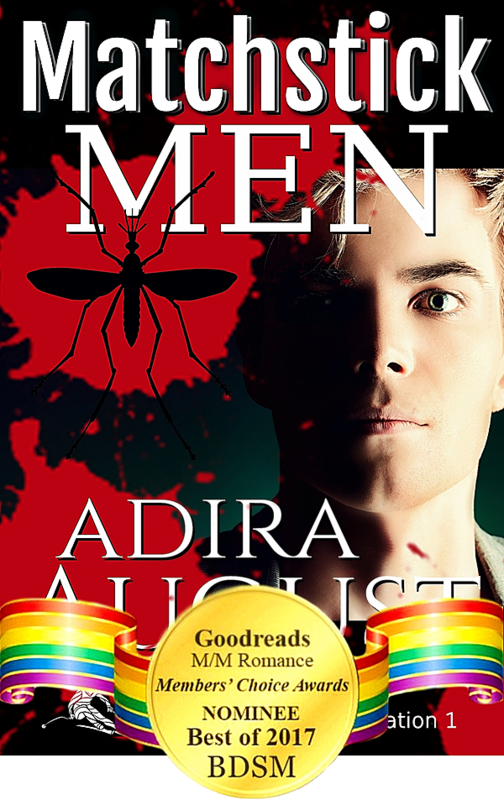 Author Q&A: Adira August + Excerpts & Giveaway! Please welcome Adira August to The Blogger Girls! What is the unqualified regret you wish you could amend? Oh, way too many to pick one! But all of them seem to be things I didn’t do, or was afraid to do, instead of things I did. What is the temptation you wish you could resist? Judging people. We’re just not equipped to do it, not knowing all things about either the person or situation. But it’s too easy, even if I don’t say it out loud, to cast judgment. And all that is, is me saying “I’m better than they are.” And that is just so not true. What is the book that holds everlasting resonance? To Kill a Mockingbird Harper Lee More recently, Glitterland by Alexis Hall. What is the priority activity if you were invisible for a day? I would not like being invisible. So I’d stay inside and do what I always do, because that way, relative to the rest of the world, I’m as visible as I always am. What is the film you can watch time and time again? Field of Dreams – for its accurate depiction of the relationship between here and there. Who is the person who influenced you the most? I bet it was Isaac Asimov. Sometimes it’s hard to know how much you are being influenced by someone. Asimov claimed he was an atheist and I’m sure he was being genuine. He was such a cheerful atheist! To me, who is not an atheist, he was a mystic. His universe and the realities depicted there are so obviously inspired, to my view. What is the unlikely interest that engages your curiosity? There’s hardly anything that doesn’t engage my curiosity. You can find a lot of it in my books. I don’t write erotica because I think it will make me a pile of cash. I’ve always been interested in what makes us human. The human sexual dynamic is extraordinarily complex. Hardly a bit of genetic control. A widely varying spectrum of desires and behaviors and biology and cultural influence. Society tries so hard to control it all, to label it, decide what’s normal or acceptable or vile. So, it’s not unlikely, but it is the thing I struggle to understand and convey and elevate and demystify. What is the unfulfilled ambition that continues to haunt you? I don’t have that, really. I’m spoiled. I did everything I ever wanted to do. I got jobs that were highly competitive just by asking. What is your earliest recollections of writing fiction? I was 8. I wrote a book in crayon on little squares of paper and glued the edges together. I self-published! Who is the figure from history you would most like to buy a pie and a pint? I have several direct ancestors who fought the Revolutionary War. I want to buy the wife of the one who first came to these shores a lunch, because women were hardly acknowledged to exist. I wish I could know her. Because her husband, the one who carried my last name – or I carry his, of course – he loved her. He cared for her in his will, gave her security for life. Senna. His nickname for her. If I wrote historical romance, I’d write about them. Lord Fairfax gave him his land because he held Fairfax’ horse when he was drunk one night and his team of surveyors were laughing at him. Washington was one of his surveyors. I have no wisdom. I might have advice, I guess: Hang on. Just hang on and try to be a little bit kinder than you think you can be. My grandmother’s engagement ring. It was stolen by a supposed “friend.” I never knew her, the ring was all I had of her. What is he crime you would commit knowing you could get away with it? Murder. I have an extensive better dead list of child abusers. But I’d need a real vision, not to tell me I’d get away with it, but to tell me it’s as good an idea as I think. What is the philosophy that underpins your life? Love is what you do, not what you feel. Who is the character you enjoyed writing the most? In the whole of the River Hart universe, it’s Benedict Hart. He’s so unexpected in his relationships. So entirely loving. Yet, I’m sure he’d be vastly surprised to hear himself described that way. I know I’m supposed to pick Hunt or Cam, and I love them so much. But don’t always enjoy writing them because they do whatever the hell they want and I’m kinda the last to know. They make me cry as often as they make me laugh. In the HuntandCam4Ever series, the character I most enjoy writing is Chez, the owner of Scene and Not Heard. He’s far more complex than I think is obvious from the brief times we encounter him. I’m thinking I’ll be writing these books for the rest of my life and I hope, someday, these bits and pieces of him will add up in the minds of readers who follow the series to paint a picture of him as I see him. Who is the character you found the most difficult to write? The Killer in Matchstick. I always end up inside them, or they inside me. It was a very hard place to be, so dark and broken. What is the book you enjoyed planning/writing the most? I don’t plan them, at all, they sort of happen to me. I’m really anticipating writing the next Hunter Dane Investigation, though, Psychic Men. These first three books form a kind of world-building, character creating triumvirate thingy. They have the power of Canon. Now we’re all set. We have backstory and history. The coming novels will be shorter with a steadier thruline. The relationship will be there, the trials and watching how they respond to those, grow, each so uniquely valuable to the crime-solving process and to each other. Psychic will be the first of those. What’s interesting to me is, all the psychic stuff will be from actual reported experiences of average people, research programs, all that. I have to change names but the events are totally based in reality. So how fun will that be? Find out more about Adira on her Blog/Website, Facebook Author Page, Addi’s Facebook Spoiler Group or Twitter. As part of this blog tour, Adira is giving away a $25 Amazon Gift Card!! To enter, just click the link below! Don’t forget to check out JustJen’s review of Dancing Men to see what she thought of it!